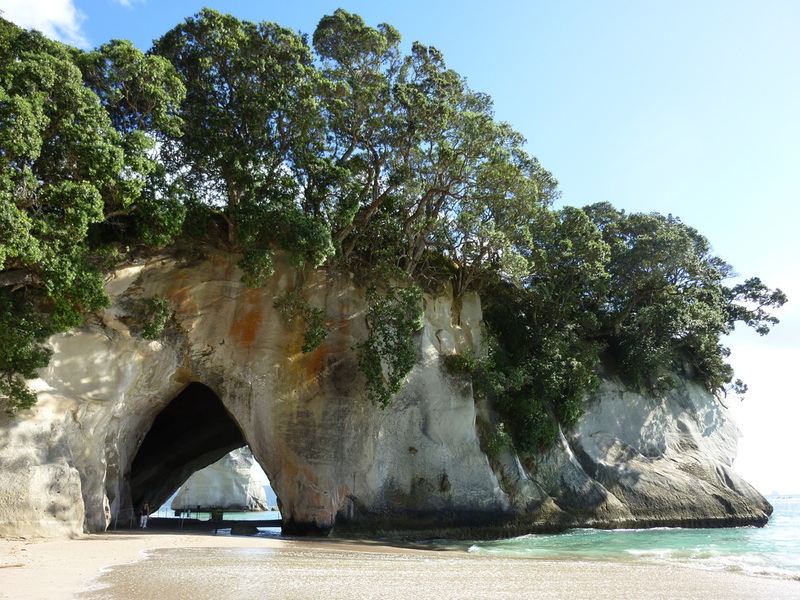 The Cathedral Cove Trip is our favourite by far! If you are looking for more than to just watch the passing scenery, the Banana Boat offers you a real feeling experience. You are close to the water and nature, with a close-to-touch experience, some ocean water splash included. 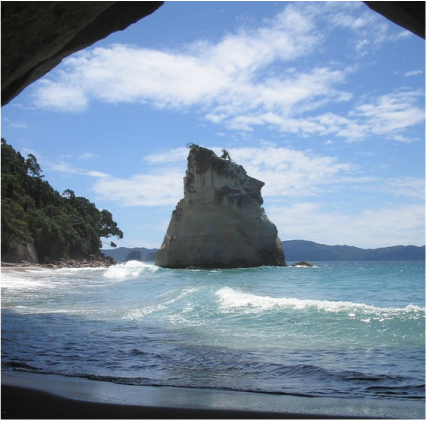 Cathedral Cove with its pristine water, white sandy beaches and its extra special feel, which is hard to describe, yet easy to recognise once experienced, has always fascinated us ever since we came to Whitianga in 1978. We both have travelled extensively throughout our lives and were stunned by its beauty when we saw it for the first time. It easily may be one of the most beautiful places on this planet. We still appreciate it every single time we come here and we enjoy the extra time this trip provides to spend with you and share some more about the area, the Cove, New Zealand and life. We meet you at the Esplanade Beach in Whitianga about 10-15 minutes before we leave. We will fit your life jackets and give you a safety talk. For those feeling less comfortable about the banana, there is always some room on the boat, for example elders, little children and those with special needs. You can take some towels and a camera on the boat and our observer can take pictures along your journey. You spend 20 minutes going past spectacular scenery to Cathedral Cove where we will put you in front of the Cove for photos on the Banana. From there we take you past Stingray Bay to Gemstone Bay in the Marine Reserve to see if we can see some fish. Then we come back and anchor the boat in front of Cathedral Cove. You can then swim ashore and explore for the next ½ hour the stunning beaches, the caves and go for a swim in the pristine water. Kali will come with you ashore and loves to show you around and point out those little less obvious gems Cathedral Cove has to offer. We then hop back on the boat for a drink and biscuits. From there on we head back to Esplanade Beach Whitianga. Trips are from $50 per person and last 1½ hours. From Boxing Day till Waitangi weekend and over Easter, we offer two trips per day. Our first trip leaves at 9am and there is also a sunset trip leaving in the evening. 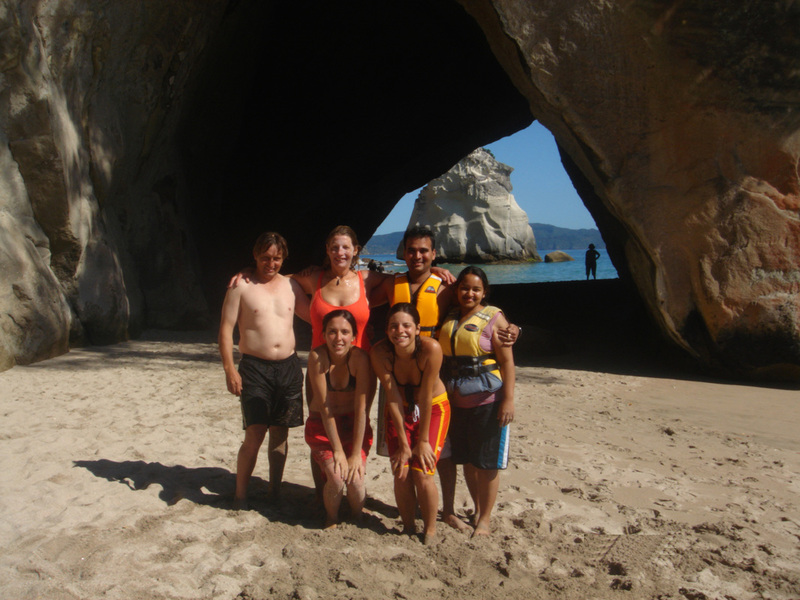 All Cathedral Cove trips do require booking! Come by the beach at Whitianga Esplanade Beach where you can find us from 9am onwards. Otherwise you may ring us on 07-866 5617 or 021 0832 8350. All other times of the year the Banana Boat can be booked for a minimum of 2 hours at $350. 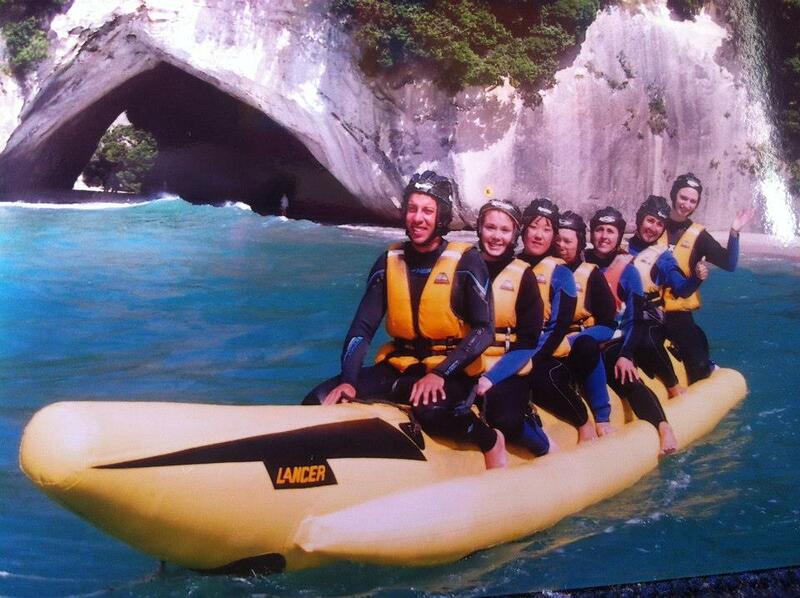 We can do trips to Cathedral Cove, Horseshoe Bay or do continuous rides off the beach. 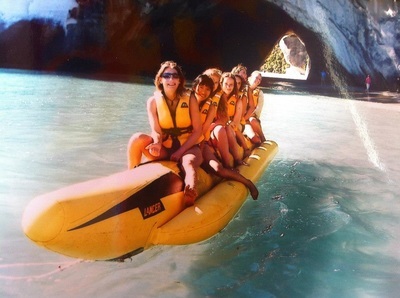 Let us know about your needs and wishes and we will do our best to meet them, so that your experience on the Banana Boat is a fun and memorable one! !